Finding a fawn (baby deer) alone in the woods or a meadow is fairly common. Many people assume that young wildlife found alone are abandoned, helpless and need assistance for their survival. In nearly all cases this is a mistake, and typically human interaction does more damage than good. If you see a fawn or other newborn wildlife, enjoy your encounter, but for the animal’s well being, it is important to keep the encounter brief and maintain some distance. A fawn's best chance of survival lies in being raised by its mother. Fawns nurse three to four times a day, usually for less than thirty minutes at a time, but otherwise the doe keeps her distance. This helps reduce the chances that she will attract a predator to the fawn. The fawn's protective coloration, near lack of scent and ability to remain motionless all help it avoid detection by predators and people. If you find a fawn you should not approach it and by no means touch it or pick it up. The mother will most likely return to claim it. If you feel that the animal is in harms way, maintain a substantial distance while still being able to observe it and contact the campus police department 459-2231 or county Animal Control: 831-454-7227. 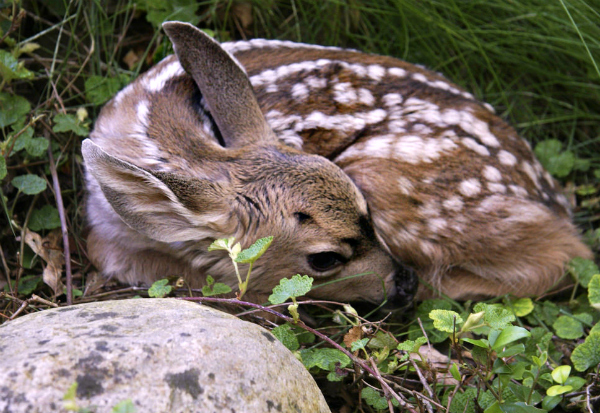 In addition to potentially harming a fawn, state and federal laws forbid possession of game and many non-game animals, so adopting newborn wildlife is usually illegal. If a fawn has been "rescued" when it shouldn't have been, it can often be released at the same location. Parents tend to remain in the area for at least a day, looking for the lost youngster.